Telenor Pakistan is now offering Free Unlimited WhatsApp usage in Pakistan. Free offer is valid for all Telenor Prepaid subscribers. 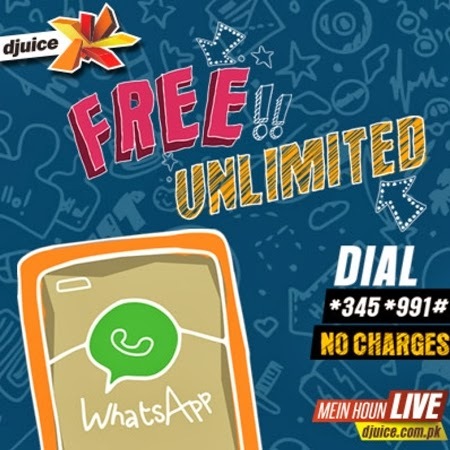 Telenor's Business Prepaid, Talkshawk and Djuice subscribers can use WhatsApp messenger absolutely free on their mobile devices by subscribing to free WhatsApp bundle. To activate Dial *345*991# to activate free WhatsApp bundle. You have to activate the offer on daily basis. Unlimited WhatsApp access, there is no max usage limit. If WhatsApp bundle will expire then user will have to activate the bundle again by dialing *345*991#. You can download WhatsApp mobile messenger app for these mobile devices iPhone, Android, Blackberry, Java, Nokia S40, Nokia Symbian (S60), Nokia Asha and Windows Phone.